Will Spyro Reignited Trilogy come to PC? Examining the fiery possibilities of Spyro: Reignited Trilogy coming to PC. Now it's landed on consoles, you might be curious if Spyro: Reignited Trilogy is coming to PC in 2019. When we asked Activision about the possibility, they offered us this statement, which has been doing the rounds for a while. 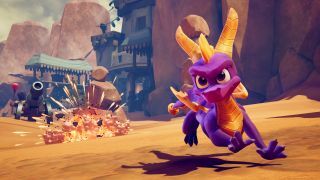 "We're excited that even more Spyro fans will have the opportunity to experience the franchise on PS4 and XB1 platforms. We do not have any other platforms to announce at this time." So, that's that. 'At this time' doesn't totally rule out the possibility, of course. As a recap, the Spyro Reignited Trilogy updates the original three Spyro games that landed on PSone towards the end of the '90s and early '00s. Those games are Spyro the Dragon, Spyro 2: Ripto's Revenge (damn that Ripto!) and Spyro: Year of the Dragon, all by Insomniac, who went on to make the decent Ratchet & Clank series after that. It was released on consoles in November. There is no further information on the possibility of Spyro coming to PC beyond Activision's statement, then. Below, we look at a couple of news items of interest from earlier this year that turned out to be dead end, and examine what Crash Bandicoot's release on PC could mean for the (allegedly) loveable purple dragon. The hell is going on in this screenshot? The biggest suggestion that Spyro's remastered trilogy could come to PC is that Crash Bandicoot's N-Sane Trilogy did so in 2018, taking us by surprise. The common factor here is that Activision owns the rights to both characters, and that it published both the N-Sane Trilogy and Reignited Trilogy on consoles. On that basis, a PC version does seem possible. That said, both collections have different developers (Vicarious Visions for Crash, Toys for Bob for Spyro), and Iron Galaxy Studios was specifically brought on-board with Crash to help make a PC release. There was almost exactly a year between the release date of Crash on PS4 and Crash on other formats, which suggests the possibility of an exclusivity deal. No exclusivity seems to apply this time, though: Spyro was released on Xbox One at the same time as PS4. To speculate, it's possible that if Activision was planning to bring the game to PC, it might've done so already. Crash looks like it sold okay on PC—Steam Spy estimates the game has between 100,000 and 200,000 owners. PC was briefly listed as a format on the official Spyro site, alongside a similarly unannounced Switch version, but this was an error that's since been corrected. It's possible Activision isn't done bringing the games to other platforms, however: Nintendo's official store listed the game for Switch earlier this year. Retailer errors are common, though, and can't be taken as evidence of anything.